This month the Eileen Hull's Inspiration Team is being inspired by Graphic 45 paper collections to create our Art with Heart projects using Eileen Hulls wonderful dies for the October Art with Heart Challenge. I am following Eileen Paper Trailer travels as she teaches across the US. I knew I had to create a travel trailer so I could travel along with her, lol. Mine is a bit more haunting than Eileen sweet Scotty!!! Along with my Rare Oddities Travel Trailer I also had to make an Old Jalopy to pull it. I began by cutting out two to the Old Jalopy pieces along with Make It 3-D pieces from matboard. Cut the Old Jalopy and Make it 3-D again using Graphic 45 Rare Oddities pattern paper. Ink all the edges of pattern paper and place on Old Jalopy and Make It 3-D pieces once the Rare Oddities Truck is made. I found some fun skeletons at our local craft store so I cut some of them up and added them to the Rare Oddities Truck. Add a few of the metal handles as the wheels. The hot air balloon comes from Graphic 45 Steampunk Spells pattern paper. Fill the back full of fall foliage and Halloween goodness, along with another skeleton. For my Travel Trailer...I cut out the mat board and formed my trailer. Re-cut the Travel Trailer using Graphic 45 Rare Oddities paper collection, ink all the pieces, adhere to the trailer. Add twine to the edges of trailer. Die cut Dragonfly using Rare Oddities pattern paper twice, ink edges and layer together at the body. Bend wings up and add a skeleton to the top. Adhere to top of Rare Oddities Travel Trailer using a glue gun. Decorate the Rare Oddities Travel Trailer with more of you fun Fall/Halloween stash. I hope you enjoyed my Rare Oddities Travel Trailer and Old Jalopy Truck. 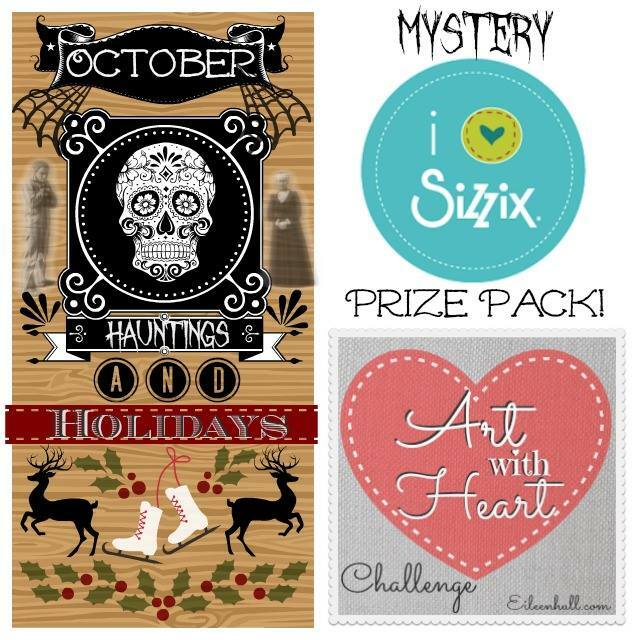 Make sure to enter your Haunts and Holiday projects!!! 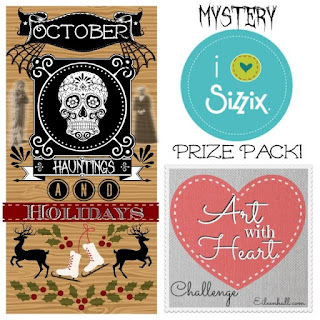 Check out Art with Heart Challenge HERE for all the details!!! I'm so happy to be apart of Eileen Hull Inspiration Design Team and help promote Eileen Hull’s wonderful products that are manufactured with Sizzix. Eileen and Sizzix so generously supply us with so many fabulous Dies and Embossing Folders to work with like those that I'm using today. Pam this project has so many amazing parts to it! The Graphic 45 papers are out of this world and coordinate perfectly with the vehicles. Also love how you chopped off the back of the truck and made it 3D! My, my, my ... cutest little camper and truck ... such amazing details ! Pam this is really the best! I love how you used Graphic 45 papers on this! Amazing! October's Craft Hoarders Anonymous Blog Hop!! !